Perfect Vault Door For Turning A Closet Into A Safe Room. The Light Weight Makes It Easy To Install In Residential Homes. 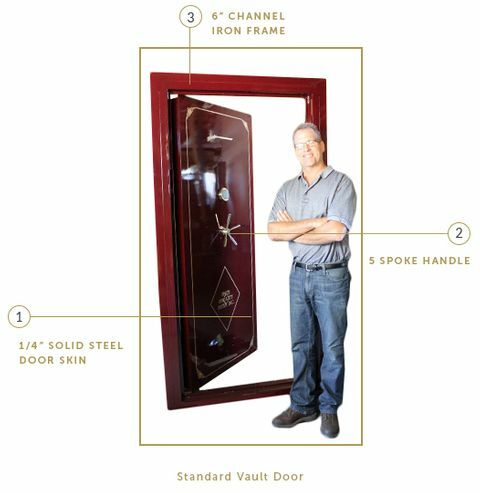 This Vault Door Is Perfect For A Wood Framed Room Fortified With ¾” Plywood Or 14ga. Steel. Best Vault Door To Use On A Concrete Room. 3/8” Plate Steel With 8” Channel Iron Frame That Goes Well With Concrete Walls. 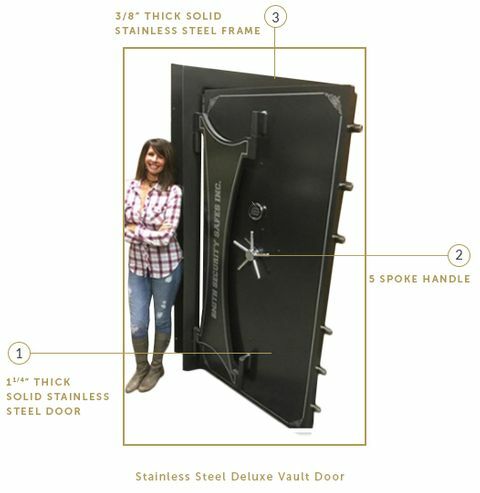 Best Selling Vault Door! ½” Door Plate With 1 ½” Plungers, Priced Well! 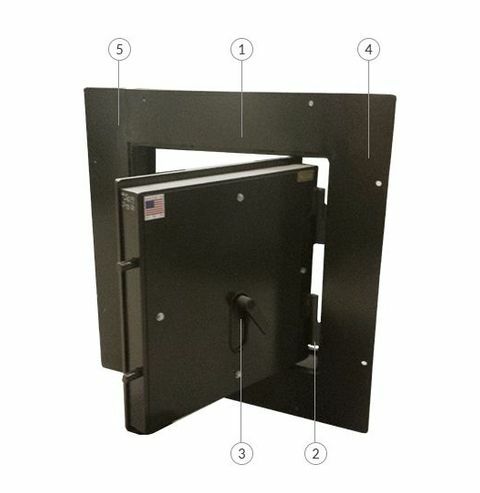 Solid 1” Thick Vault Door Plate Make This Safe Room Bullet Proof And A Challenge For Any Thief. This Vault Door Is 1” Solid Steel Door Skin And 3/8” Thick Frame Along With An 11Ga Sheet of Stainless Steel. Made For Maximum Security! 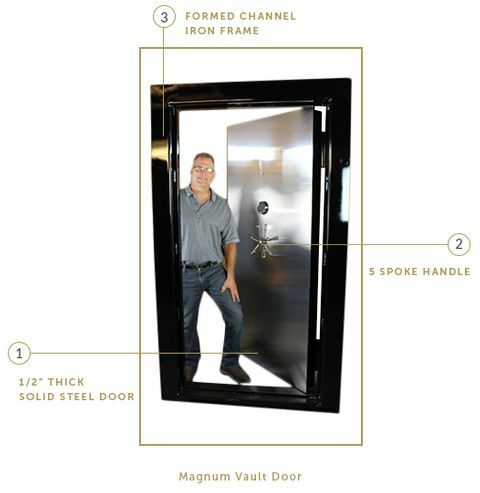 Vault Door Has 1 ¼” Thick Solid Stainless Steel Plate Along With A Solid Stainless Steel Frame. The Best 3000 lb. Door On The Market! 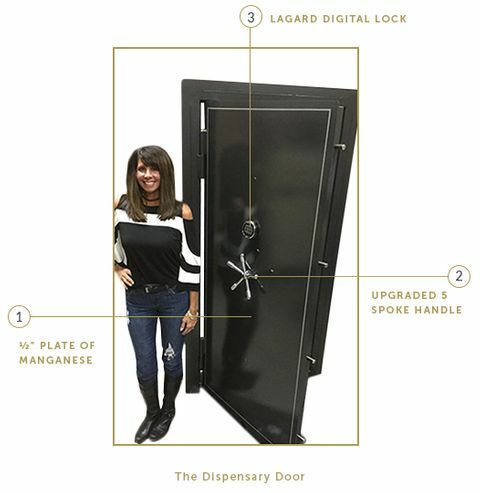 The Perfect Vault Door For Keeping Your Inventory And Cash Safe. Bypass Lock Key, Full Inside Flange, Escape Hatch & more. 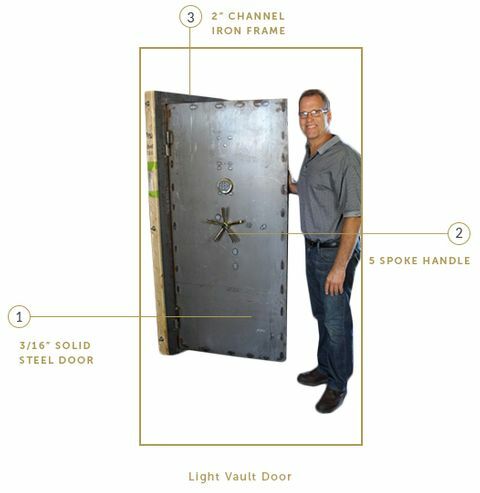 Here at Smith Security Safes there are a plethora of different kinds of vault doors to choose from. We have vault doors in all shapes and sizes to fit most security needs. We have simple install vault doors you can install yourself, but we also offer a delivery service that will have our trusted installer deliver and install the door for you. 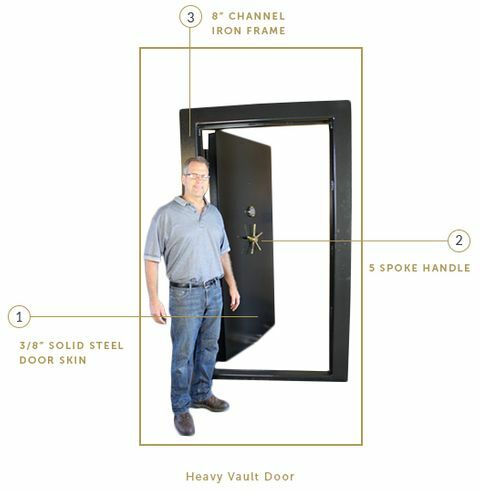 If for any reason you do not see what you desire from a vault door, any Smith Security vault door can be customized to fit your needs. We do offer many different aesthetic and security options. You can have a vault door that is bare bones with zero options that isn’t even painted, or you can get the cream of the crop, decked out, nearly impenetrable door that looks incredible. 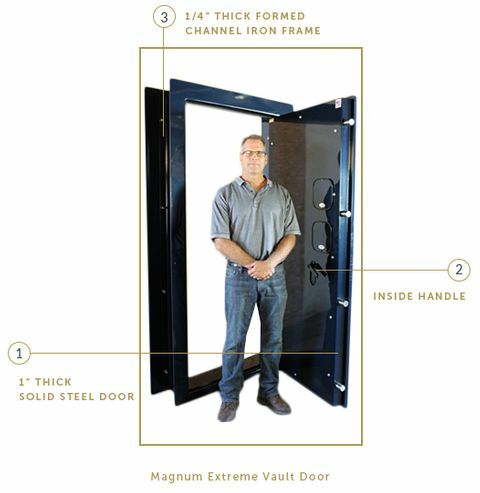 There are many options you can have your vault door equipped with that will provide extra security. Depending on how you want the vault door to look you can have the door painted with a high gloss paint or a textured paint for a matte look. You can also have your vault door covered in stainless steel for a very cool look and added security. Pinstriping is an option that adds a certain class to the door. It just looks great and we will pinstripe customized words onto the door for you. There are various types of handles from a 5 spoke to simple down spoke handle. There are different types of locks we offer from just key, to digital, to biometric depending on what you desire. We offer an inside handle so you can more easily let yourself out of the vault door after it has closed. You can save big bucks by opting for the easy installation application which makes it very simple to install the vault door to your walls. We have the option to have an outside or inside swinging door depending on your needs. We can equip your door with a thermal re-locker. This device will completely lock down the vault door in the event of someone attempting to break into your vault with any device that creates heat like a cutting wheel or cutting torch. The honey comb is a structure inside the door that makes it much harder to cut all the way into and through the vault door. 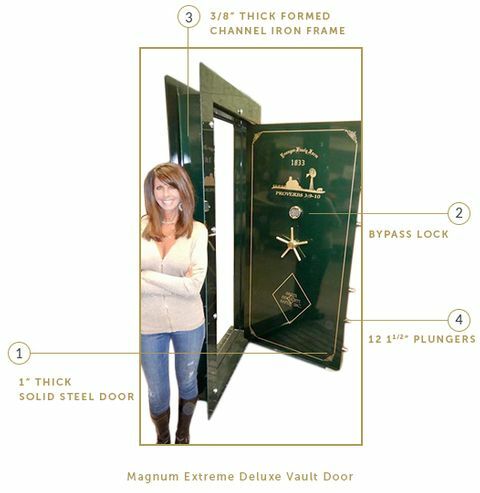 Vault doors serve a purpose to protect your most valuable property and they can also provide a critical shelter of last resort for yourself and loved ones. I have been in the security business for well over 30 years. We have helped countless people meet their security needs and look forward to helping you as well. I am always available to discuss your security needs, just give me a call. I am here to assist you to build a quality vault door and offer you excellent service. I have been in business for over 30 years and after 30 years of building doors I can tell you that it is hard to imagine a type of job that I have not done. So, if you do happen to find yourself in a pickle and need a security solution please give me a call!